A New England supermarket chain's epic family feud is over. 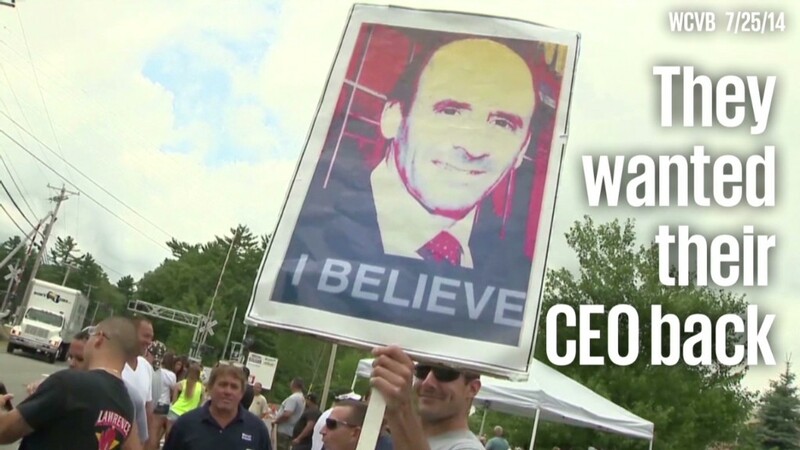 Arthur T. Demoulas, the ousted president of Market Basket, reached an agreement late Wednesday to buy out the stake in the 71-store chain controlled by his cousin. The deal ends a 10-week standoff that included employee protests and a customer boycott. Terms were not disclosed. The Boston Globe said the sale price was upward of $1.5 billion, citing a source briefed on the negotiations. In the end, the governors of Massachusetts and New Hampshire got involved in negotiations to reach a deal. The dispute began in June when the company's board replaced Demoulas, who was beloved for his leadership but had long feuded with his cousin, Arthur S. Demoulas, over control of the family-owned company. Arthur S. and his family controlled 50.5% of the shares of the company. Employees sided with Artie T., as the Market Basket president is known, and asked customers to boycott. Deliveries were halted to the stores, resulting in empty shelves, and hours for part-time employees were slashed. The sale's announcement left the employee group backing Artie T. ecstatic. "Details are emerging as we write this but we wanted to let the world know that we have emerged from this crisis victorious!" said a statement posted on the Web site of We Are Market Basket, the group of employees and customers. Artie T. addressed a crowd of employees and supporters outside the company's headquarters Thursday morning, saying that the victory was one for workplace equality. The chain, with 25,000 employees, is known for a generous profit-sharing program and workers who stay with the company for long tenures, working their way up from entry-level jobs to top management positions. "As I stand before you I'm in awe of what you all accomplished," he told the group. "You have demonstrated to the world that it is a person's moral obligation and social responsibility to protect a culture that provides an honorable and dignified place in which to work." The company's statement said Artie T. and his management team would return to the chain immediately. Two outside co-CEOs who were brought in by his cousin will remain in place until the sale closes, which is expected in the next several months. All employees were invited to return to work. But the financial impact of the idle stores may have caused lasting damage to the company's finances. It is believed to have lost several million in potential revenue daily -- a major blow in the grocery industry, whose profit margins are low. The situation also hurt employees. Management repeatedly threatened to terminate workers who did not show up, but held off while negotiations for a sale were ongoing.